•This tool will accumulate a numeric value encoded in the river network. For each polyline it will accumulate all upstream values including the polyline itself and write it back to the river network. Such a value could be a hydrological value, number of structures, species diversity, a score to fish migration, in fact any numeric value that makes sense when accumulated! An example is shown below. A network encoded with a value you wish to accumulate. Note this dataset has zero values and NULL data. have been converted to zero. •Any Null values encountered are interpreted as ZERO values. The minimum value encountered whilst accumulating upstream values. The maximum value encountered whilst accumulating upstream values. The mean value, this includes all NULL values which would have been converted to zero. The total number of polylines visited, this includes the polyline itself. 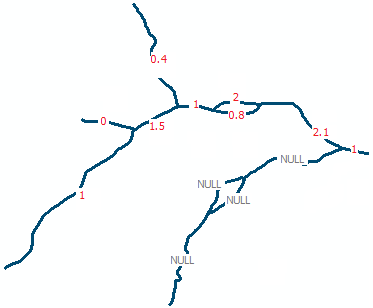 The total number of NULL value polylines visited, this includes the polyline itself. The mean value excluding NULL value polylines. •You must select a numeric field to accumulate and provide the output field name. The output field name is the field created in the river network which will contain the accumulated value. If you tick create optional statistics then you must provide a 5 character prefix. If you do not set this then RivEX will automatically generate a prefix based upon the first 5 characters of your output field name. Fields with the same name will be overwritten! As this tool will create new fields in your network RivEX will force a rebuild of the topological caches as the modified date will have changed the next time you attempt to use this network with RivEX.